Aiken’s 19th century economy was tied to the farming of cotton, fruit, and vegetables, but the mining of clay was one of the main industries. An 1869 article describes the use of kaolin, extracted from Aiken County’s seven mines, in manufacturing rubber, paint, paper, and pottery. Tourism was also a significant factor in the town’s economy, before and after the Civil War. Booklets touting Aiken as a “health and pleasure resort” drew visitors during the winter. Glowing reports described Aiken’s climate, elevation, soil, and the “recuperative qualities of its pure, dry atmosphere” which had been experienced by “many thousands of invalids.” There were several churches, good schools, well-stocked stores, and doctors in town. By the 1890s, Aiken had also become a sports and recreation center for hundreds of wealthy winter residents who came to ride horses, hunt, play polo, golf, and tennis, and enjoy the 139 parks. The year-round population more than doubled between 1889 and 1935, with the greatest growth occurring in the 1920s. Eastern European Jews contributed to the population growth in a chain migration initiated by H.L. Polier, who migrated from the Northeast in search of better health. According to her daughter Esther, when Sarah Anna Polier Surasky joined her husband B.M. in Aiken, the Polier families were not keeping kosher and had abandoned many other Jewish traditions. 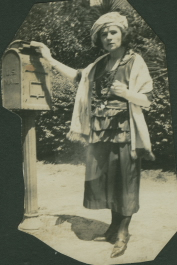 Sarah insisted on observing the laws of kashrut and immediately began taking train trips to Augusta, Georgia, to stock up on kosher products. In her zeal, Esther noted, she had “soon converted her relatives.” She and B.M., who had been a rabbinic student in Poland, were primary figures in the push to form a congregation. B.M. was their lay leader, acting as cantor and rabbi at the services held in homes of the congregants or in the Masonic Hall above one of their stores. Sarah rejected B.M.’s qualifications as shochet (kosher butcher) however. Because he kept his store open on Saturdays, the day farmers came to town, she found his butchering of chickens unacceptable. In the decades that followed, Jewish-owned stores dotted the streets of Aiken’s business district, particularly Laurens Street, one of the main corridors. The Polier brothers’ dry goods stores were joined by Mrs. M.S. (Augusta) Polier’s millinery shop, and three Surasky stores: B.M. Surasky, Surasky Bros., and H.C. Surasky, all purveyors of men’s and ladies’ clothing. M.S. Polier opened a barbershop next to his wife’s store. The Rudnicks got their start in dry goods and furniture with credit extended by Jewish wholesalers in Columbia, Augusta, and Charleston. In the 1930s, they focused their business on furniture only. Other store owners included Nathan Poliakoff, Julia Wolf, George Payeff, Nathan Persky, Nettie Franzblau, and Nathan Franzblau, a hardware merchant who had moved to Aiken because of his asthma. Isadore Efron ran a garage and taxi service. One of his fares was a little boy he picked up at the train station with a request to drive him to his grandfather’s plantation near Barnwell. The boy was future President George H.W. Bush, visiting his mother’s family, the Walkers. ​One of the Surasky brothers didn’t live long enough to make the transition from peddling to shopkeeping. Abraham was brutally murdered in 1903 by a farmer while out in the country peddling. The farmer claimed he was defending his wife’s honor and was acquitted despite testimony from a witness describing the defendant’s animosity toward Jewish peddlers. A possible motive of anti-Semitism was supported by additional testimony indicating premeditation. Weeks before the murder, the farmer had announced his intention to kill Abraham. Unfortunately, the witness was a black woman and her testimony held little weight against the testimony of the farmer’s wife. Tragedy, fear, and injustice, shades of the world the Poliers and Suraskys had left, tainted paradise. In the first years of the 20th century, the state of South Carolina, at the urging of a Columbia banker, created the Department of Agriculture, Commerce, and Immigration with the intention of attracting “desirable” European immigrants, specifically Russians, to take up farming. The campaign, “South Carolina, The Garden of America,” gained the notice of socialist Charles Weintraub who purchased Sheffield Plantation in Montmorenci, near Aiken. He and ten Jewish families moved there in December 1905, determined to establish a successful socialist farming colony. The charter for their “Incorporative Farming Association,” popularly known as “Happyville,” declares their intention to raise stock, grow cotton, fruits and vegetables, gin cotton, cut timber, saw lumber, and grind grain. Fifteen more Jews joined the original group in early 1906. The colonists visited at least one of the Jewish families in Aiken. Mina Tropp, the daughter of H.C. Surasky, was a child at the time, but remembered the elegant clothes worn by the women. During the visits, her father would debate the merits of socialism with Weintraub. The colony faced insurmountable challenges including bad weather, insufficient funds, and land unsuitable for farming. By July 1908, they had sold the land and dispersed. The land was purchased by none other than Weintraub, in partnership with three of the Surasky brothers. Sometime later, the Suraskys bought Weintraub’s share and ultimately sold the land in 1916. On January 7, 1913, as trustees of the “Sons of Israel,” the Polier and Surasky brothers and M. Poliakoff purchased land for a burial ground for three hundred dollars. The first occupant of the Sons of Israel Cemetery was Ralph Panitz, husband to Sophie Halpern, the future Mrs. Morris Rudnick. Ralph’s tuberculosis precipitated their move to Aiken from New York, but his health continued to decline. It is interesting to note that he died the very day the cemetery was purchased. The families with the most plots are the Wolfs, the Suraskys, and the Poliakoffs. The high number of Poliakoff plots reflects, in part, the desire of family members in Abbeville and Anderson to be buried in the cemetery with their Aiken relatives. A memorial plaque dedicated to the Poliakoff family posted at the cemetery‘s entrance remains something of a mystery. How and why it was installed is yet unknown. 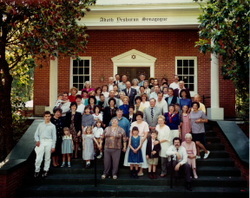 Adath Yeshurun congregation, founded by less than two dozen families, was incorporated in 1921. Because the congregation was small in size, members had to work especially hard to develop lasting institutions. The synagogue was built in 1925 with a three thousand dollar mortgage; five years later a downstairs hall was added. After B.M. Surasky’s death in 1934, Nathan Persky, B.M. 's son-in-law and a graduate of a Polish seminary, assumed the duties of lay leader. Services were held in Hebrew and the women were seated separately from the men, in accordance with Orthodox tradition. The Ladies Aid Society, which had provided care to needy Aiken families, was reorganized in 1938 as a local chapter of the Hadassah Sisterhood. The congregation never had a full-time rabbi, although a woman who immigrated to Aiken as a child recalled two men hired by members in the early years. One was Rabbi Jacob Silber, whom the congregation set up with his wife in a grocery store in order to supplement his salary. It is not known when he was hired or how long he stayed. He was preceded by a shochet who also conducted services and taught the children Hebrew. For the most part however, the congregation relied on its lay leaders for services and education. 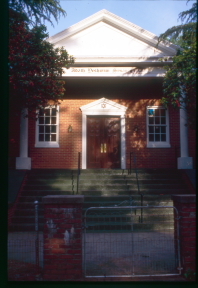 For High Holy Day services, Aiken Jews would travel to the Reform or Orthodox synagogues in Augusta, Georgia, approximately twenty miles away. Rabbi Karesh of Columbia frequently officiated at rites of passage such as circumcision and marriage. Rabbis Poliakoff of Augusta and Axelman of Charleston also provided their services to the congregation for special events. By the late 1930s, when there were approximately 7000 people in Aiken, the Jewish population had grown to an estimated 100. Involvement in mainstream Aiken society, as well as in the Jewish community, was the norm for Aiken’s Jewish citizens. B.M. Surasky was an early example. He served for ten years as one of six intendants, or city council members, and was a Mason and a Shriner. His son, Mandle, also was an intendant and was elected Mayor ProTem while serving on the council. 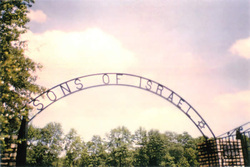 Aiken Jews joined civic groups such as the Masons and the Rotary Club. They were involved in the Chamber of Commerce and were supporters of organizations such as the American Red Cross, the Boy Scouts, and the Salvation Army. The Jewish Ladies Aid Society provided support for Aiken families affected by poverty and illness, and helped to raise money for Aiken County Hospital. The immigrants emphasized the importance of education to their children, many of whom attended college to become lawyers, teachers, and engineers. Mina Tropp became an acclaimed artist integrating actual flora into her paintings. She was also known for her humanitarian work, devoting considerable time and energy to raising money for charitable causes. She and her husband adopted five children orphaned by World War II and vigorously supported failed legislation designed to rescue Jewish children from war-torn Europe. Shad Polier, Harris’ son, graduated from Harvard Law School and married Justine Wise, daughter of famed Rabbi Stephen Wise. Shad Polier was an activist lawyer who worked on behalf of child welfare and civil rights. In the 1930s, he was on the defense team that appealed the infamous Scottsboro Boys case in Alabama. Marriage and careers pulled many members of the second generation away from home. Some stayed, however, and made their marks in Aiken. Mandle Surasky graduated from the Citadel as a civil engineer, but dutifully returned home to help his father with the store. He was recognized for his contributions to local government and civic organizations when he was awarded the title of Aiken’s Man of the Year in 1966. Herbert Rudnick, son of Sophie and Morris, worked for more than two decades on behalf of children with cognitive impairments. Beginning in the 1950s, with the building of the Savannah River Plant, which processed plutonium for hydrogen bombs, the face of old Aiken changed. An influx of workers, mostly from the Northeast, doubled the population. Jewish employees of DuPont and Allied Chemical boosted membership of the congregation. The newcomers were embraced by older residents who provided support and friendship during times of trouble. When one transplant died within days of moving to Aiken, the congregation rallied to aid the family, who were strangers in their new town. Another transplant reports that life was difficult for his family after their move to Aiken. However, he credits his fellow members at Adath Yeshurun with helping to ease the stress, leaving his family with fond memories of their time in Aiken. The congregation began to invite rabbinical students from New York to conduct High Holy Day services, a practice continued to this day. Difficulty engaging student rabbis annually prompted members to seek affiliation with one of the congregational unions. A Conservative affiliation proved unrealistic as the congregation was unable to fulfill the organization’s requirements, such as maintaining a kosher kitchen in the synagogue. Thus, for little over a decade, Adath Yeshurun has been affiliated with the Union for Reform Judaism. Despite this, the congregation still uses a Conservative prayer book. Membership has increased slightly in recent years to about 45 families, but the average age has risen as well with the loss of several young families due to cutbacks at the “Bomb Plant,” as it is commonly called. Recent arrivals tend to be retirees or people associated with equestrian enterprises. Congregants are pinning their hopes on a new company moving into the area to bring an infusion of younger members.